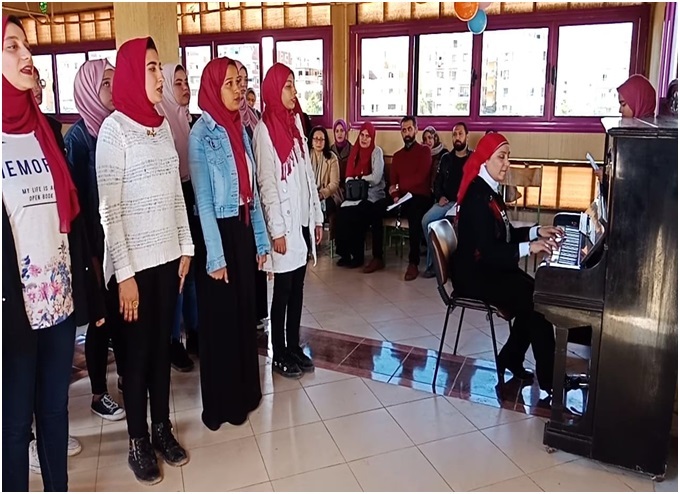 Student Group Tofolitna headed by Dr. Ahlam Kotob , Early Childhood Department Chair has organized a musical event directed by prof .Dr. Rania Mostafa ,Professor of Musicology at Helwan University. Student Group Tofolitna headed by Dr. Ahlam Kotob , Early Childhood Department Chair has organized a musical event directed by prof .Dr. Rania Mostafa ,Professor of Musicology at Helwan University. The program included many anthems, the national anthem, National songs, Eastern and Arab music and contemporary songs. The event took place on Thursday 6/12/2018 with the participation and assistance of Ms .Alaa Abdel Malek and the third year students in the department .Many invitees attended the event namely Prof. Sally Michael Hanna, Vice –Dean for Educational and student Affairs, Mr. Ahmed Allam Director of student Activities and Mr. Ahmed Saed his assistant .Many faculty members have also attended and expressed their appreciation of the level of effort exerted by Dr. Rania and the students whose musical abilities are a reflection of talent and discipline .Thanks to Dr. Rania for her great support.